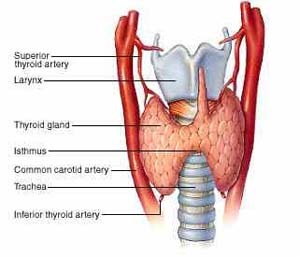 Thyroid is One of the most important glands in our body is the thyroid gland. It is shaped like a butterfly. When it doesn't function properly, it can make you feel nervous or tired and you may experience muscular weakness. Sudden weight gain or loss, dry skin patches, memory loss, and irregularities in your menstrual flow are all part of a thyroid disorder. It can even cause miscarriage and infertility. Not just that, women are 4 times more prone to thyroid disorders than men. It has two cone-like lobes or wings, lobus dexter (right lobe) and lobus sinister (left lobe), and the two lobes are connected together by the isthmus.The gland is situated on the anterior side of the neck. A lot of people who see a doctor have similar experience. When he/she was told that he/she was suffering hyperthyroidism, hypothyroidism, or thyroid nodules, he/she wanted to know more about the diseases. A lot of doctors will keep silent and only tell them a lot of digits, such as T3, T4, or TSH. The patients do not have any way to know deeply about the development of the disease. Although some patients’ T3 and T4 levels return to normal, they still have a lot of obvious symptoms, such as bulging of eyes, irritable, neck swelling . Doctors tell them it is unnecessary to take notice of, and then stop the treatment. Such treatments focus on figures only, with no regard of the real recovery of the patient's body and mind. And this will cause the disease to recur constantly. These can be due either to an abnormal thyroid gland, inadequate levels of thyroid hormone replacement (the treatment for hypothyroidism), iodine deficiency disorder (IDD -- remedied by the use of iodised salt),not enough hormones released by the pituitary gland to the thyroid, or the treatment for hyperthyroidism, thyroid nodules or thyroid cancer. Some individuals are more likely than others to have a thyroid problem. These include those with high cholesterol, those who have lost or gained more than 2 kilos in 2-3 months, those who feel exhausted, those suffering from infertility, and those with a family history of thyroid disease. It affects 1.5 per cent of the population and its incidence is higher in women than men (4:1). Also, women in their reproductive age are more vulnerable. The menstrual cycle, pregnancy, delivery and related hormonal, immunological and other stresses make women more prone to these problems.Thyroid related diseases can also be hereditary. Hashimoto's thyroiditis and Grave's disease may run in families. Hyperthyroidism is the term for overactive tissue within the thyroid gland causing an overproduction of thyroid hormones (thyroxine or "T4" and/or triiodothyronine or "T3"). Hyperthyroidism is thus a cause of thyrotoxicosis, the clinical condition of increased thyroid hormones in the blood. When it comes to the thyroid, it sometimes seems that the symptoms of a thyroid that is underactive (hypothyroidism) or overactive (hyperthyroidism) can be as hard to pin down as the diagnosis itself. Open any medical reference or check out any web site, and you might see very different lists of the symptoms supposedly pointing to thyroid problems. Goitrogens are naturally-occurring substances in food that can interfere with the functioning of the thyroid gland. There are two general categories of foods that have been associated with disrupted thyroid hormone production in humans: soybean-related foods and cruciferous vegetables like broccoli, cabbage, cauliflower, turnips, mustard etc. Other foods not included in these categories -- such as peaches, strawberries, peach, peanuts, radish, tofu, spinach and millet -- also contain goitrogens. Patients with hypothyroidism should avoid the intake of iodine containing foods such as red food dyes, iodine in multivitamins and metabolic boosters, dairy products, shellfish, and processed foods that can block iodine absorption.